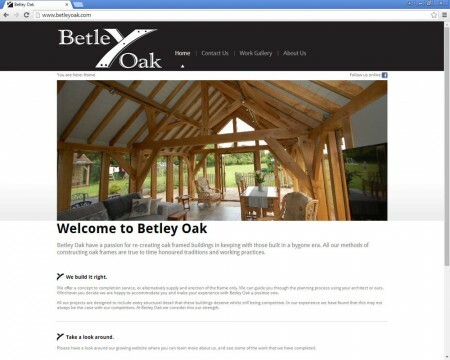 Betley Oak have a passion for re-creating oak framed buildings in keeping with those built in a bygone era. The Ancient and Modern combine beautifully in the Betley Oak site. Just covering the basic doesn't have to mean a bland and boring web site; after all, you are trying to tell the world about you and your services. The Betley Oak site does more than cover the four key elements of who are we, where are we, what do we do and how can we be contacted. It also acts as the online "showroom" for a highly skilled craftsman in a way that a more traditional printed advert could ever do.